Israeli soldiers abducted, on Sunday at dawn, four Palestinian teenagers, in Beit Ummar town, and the al-Fawwar refugee camp, in addition to summing another Palestinian for interrogation, in Hebron governorate, in the southern part of the occupied West Bank. 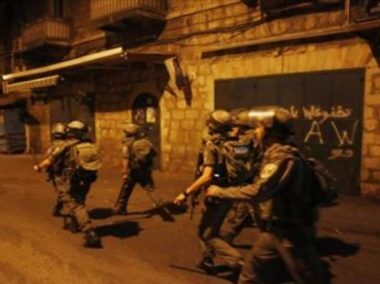 The soldiers invaded several neighborhoods, and the town’s center, in Beit Ummar, north of Hebron, before breaking into and violently searching homes, and abducted Karim Hamdi Abu Mariya, 16, Mo’tasem Jamal ‘Alqam, 19, and Ala’ Jihad Sabarna, 19. The soldiers also assaulted Ala’s father, and his brother, leading to several cuts and bruises, and caused damage to their home. Also in Beit Ummar, the soldiers invaded and searched the home of Raed Khalil, and summoned his son, ‘Ala, for interrogation in Etzion military base and security center, north of Hebron. Furthermore, the soldiers, stationed at the al-Fawwar refugee camp junction, south of Hebron, abducted a young man, identified as Mohammad ‘Alawna.